It could work well with Zoolock. 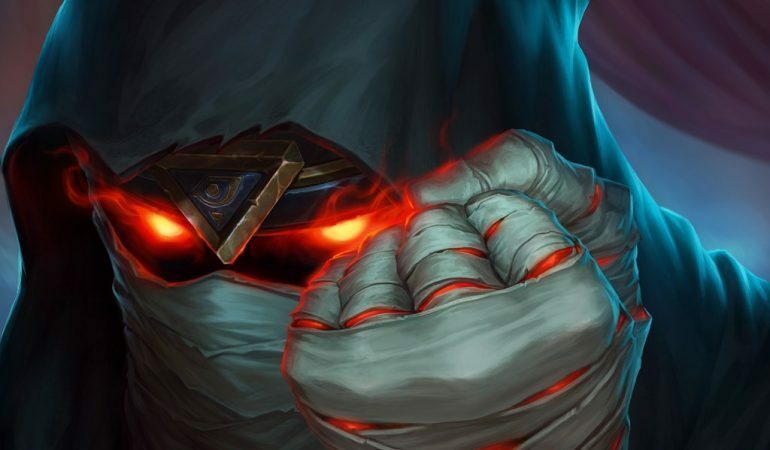 Almost all of the cards from Hearthstone’s upcoming expansion, Rise of Shadows, have been revealed. There’s only a few more to go before fans can finally dive into the action. Aranasi Broodmother is the latest card to be unveiled. It’s a six-mana Demon with four Attack, six Health, and Taunt. When you draw the card, you’ll restore four Health to your hero. It’s not the strongest Warlock card, but it does have a few possible uses. It’s a Demon, so it will synergize nicely with a number of other cards. Its stats are on the weak side considering its six-mana cost, but its heal could come in handy. Aranasi Broodmother is a card that could work as a stalling tactic to facilitate a combo. It can be used effectively to protect your hero, while you fish for the correct card setup. It would allow Plot Twist to come into play—you could put Aranasi Broodmother on the board, use Plot Twist, and find that all-important kill card. 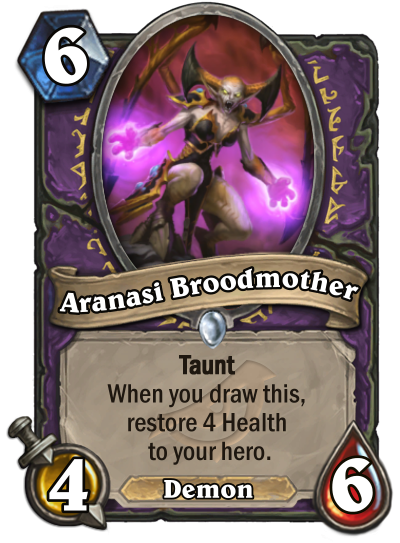 Aranasi Broodmother would also be a good pick for Zoolock. It’s expensive, but combined with cards like Lightwarden and Happy Ghoul, it would be more than ideal. You can check out all of the Warlock cards when Hearthstone’s Rise of Shadows expansion is released on April 9.